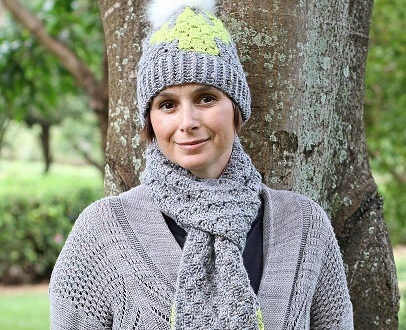 2014 was the year when she started learning some stitches and today Tonja Pe Benito is the owner and Designer of Pink Plumeria Maui, a lovely Crochet Business that she started from scratch. Her mother started teaching her some stitches and later when she started loving the craft she decided to learn more of it. She tells us, “I then went on YouTube and taught myself everything I now know. It all comes very naturally.” It is really awesome to see how social media helps all of us to dive into this beautiful sea of Crochet. Her Mom and her Sister are always by her side and keep encouraging her for this wonderful art and the handmade business she is running successfully. She tells us “My mom and sister are my cheerleaders.” However, as she tells us her Husband though supports her, is still skeptical about the work she does. Being mom of 4 boys she works on her crochet pieces and patterns mostly during nights when the kids are asleep. I am sure most of us would agree to this and know that night time is sometimes the most productive since during the day we have to have the family life we all deserve. She is really awesome, we follow her and love her creations. Also, she has recently started taking some outdoor pics with her beautiful crochet work and we love it. You should check out her Instagram to see how amazing her work is. She manages all her social media handles and is very kind enough to give answers and have a little chat. All she wants to tell you is “Be you! Don’t try to be like someone else.” We think it is really worth listening to her advise. Being you is always better. Do what you love and love what you do. If you think have the heart for it, do it. If you think this is what you would enjoy doing for the rest of your life, do it. But if you think you are failing, still get up and do it. Never Give Up. She is a lovely lady and an awesome person. Kudos to her for managing such a lovely business with all her hard work, patience and managing the family at the same time. You Go, girl!!! !